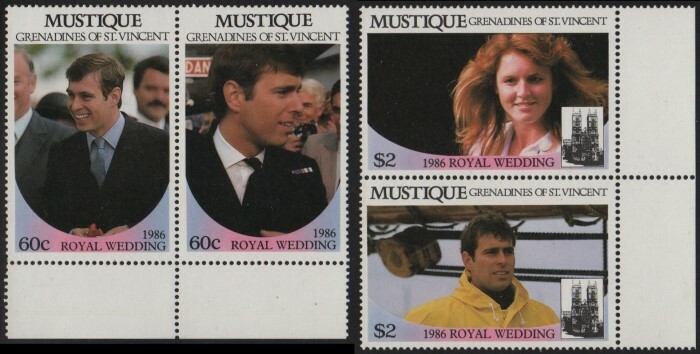 The 1986 Royal Wedding stamps issues for Mustique is probably one of the most facinating (for me anyway) as the set was never issued! They were fully produced but apparently for what ever reason were stopped from being issued. What is really interesting is that very little was saved! Therefore the Mustique issues are the rarest of all! 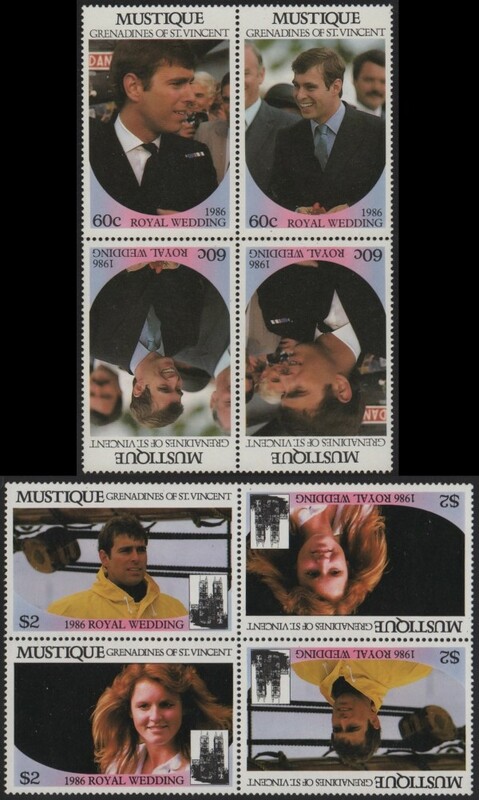 Very few collections of even the normal 1986 Royal Wedding issues is complete as most do not have this set. But first I must present the story about the tete-beches. It is an interesting story. I have found for Mustique that there are none! A souvenir sheet was never produced for the Mustique issue. There was never a 2nd issue made because there never was a 1st issue that was postally issued. So then, what is so interesting? Almost all the press sheets were destroyed! NO INTACT UNCUT PRESS SHEETS EXIST. Save for a proof sheet. Please read on. In the sale of the archive 6 uncut press sheets were found of both values. 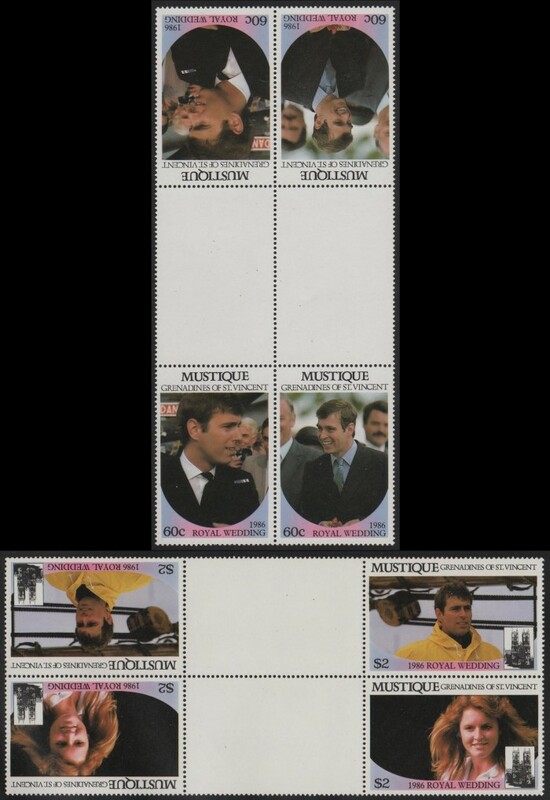 Mr. Bileski was the buyer of five sets of these along with the major portion of the 1986 Royal Wedding press sheets for all the other countries. It is unknown what happened to the 6th sheet. Possibly sold to another dealer and broken for resale. 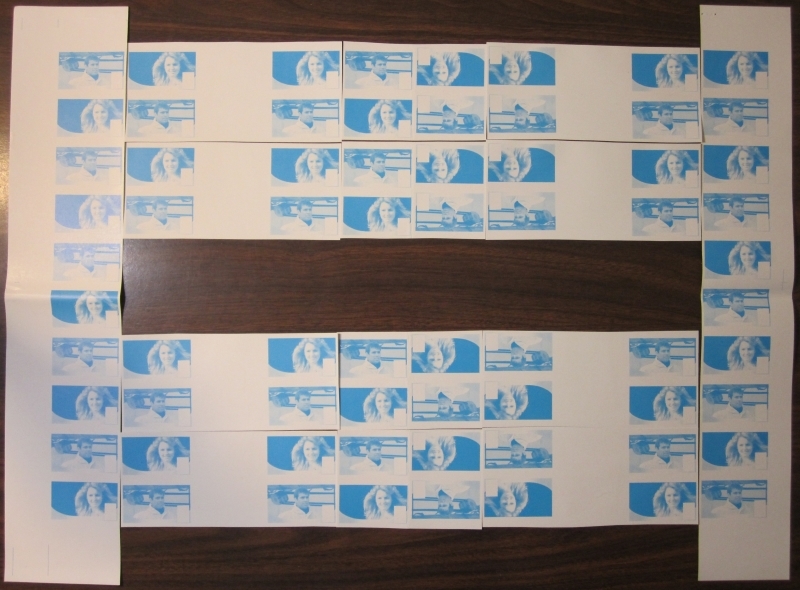 It appears that one or a couple sheets were retained by Urch Harris Stamp Company and broken into tete-beche blocks and possibly normal blocks and pairs to sell as an unissued Novelty. I do not think that they sold well at the time as much controversy was already happening in regards to varieties produced by the printer at the time. Here is an image of the ad that came with the stamps. From the way I have seen several of these sets with the ad I would say that no gutter pairs or blocks were retained from whatever sheets that Urch Harris had. At that time there was no regard for the gutter formations, only the tete-beche pairs and blocks. Therefore the gutter pairs and gutter blocks from the five uncut press sheets Mr. Bileski purchased from the archive were and are believed to be the only existing gutters left in the world. Basing on the 6 sheets found in the archive of each value we can calculate that 5 x 6 = 30 of these gutter blocks or 60 gutter pairs could exist. This means 30 tete-beche gutter blocks of each value and 30 straight up gutter blocks of each value can exist. The same number of tete-beche blocks could exist. I must note here that due to the sales by Urch Harris I would possibly double the number of tete-beche blocks or pairs. Even with this figure one can see that even the tete-beche blocks are very rare. In my acquisitions of the Bileski estate I have managed to reunite a major portion of tete-beches he created of this issue. 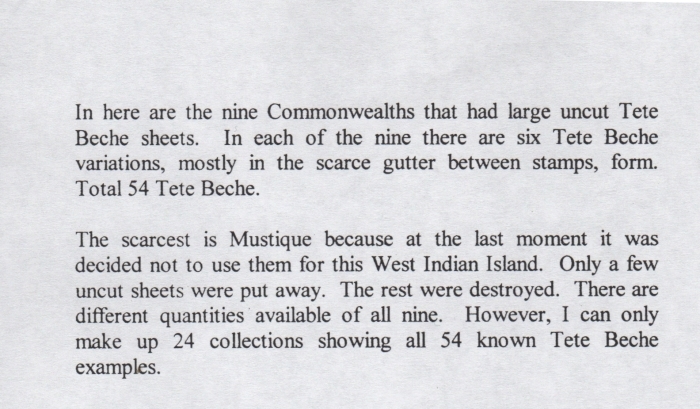 Mr. Bileski states in several writeups that he received 5 uncut press sheets of Mustique. So the count on the Bileski side would have been 25 complete matched sets of gutter and tete-beche blocks! For Mustique I believe now I have recovered almost 100%! The reason is because of a single write-up Mr. Bileski wrote. He states he could only make 24 complete sets of all the countries of the Eastern Hemisphere side. This shows he only could make 24 sets from the Mustique sheets. Probably the 25th set was damaged. Here is the writeup. Referencing from the Robson Lowe count of sheets found in the archive and the additional sheets recovered from the police evidence stock I can assure you that the tete-beches and gutters are very rare! The gutters more so. One big reason is because NO PRESS SHEETS NOR REMAINDERS WERE FOUND in the police evidence stock. 30 tete-beche gutter blocks and 30 straight-up gutter blocks of both values could exist. Around 30-50 of tete-beche blocks. Approximately 20-30 tete-beche pairs. This shows I have recovered all but one set of the gutters from both values. As far as large selvage stamps go, 10 pairs can exist from each sheet, 5 from each side, thus 60 pairs. So possibly another 40 with Urch Harris stock. Not a lot with the millions of collectors out there. Therefore only around 90-100 pairs of each value probably exist now. Then divide that by 4 for the different corners if the selvage has not been removed already. You see my point? VERY Rare! I have recovered 3 corner sets (all four corners) from the Bileski estate. An oddity is that two sets have a blank stamp on the left side and larger selvage on the right where one has this cut into narrower selvage (I would say the standard selvage judging from other sheets). I do not know why this is this way. Several pieces from other countries I have found with this same oddity. Noting here that normal pairs and blocks do exist which are remainders of the sheets mainly on the Urch Harris side. Quantities unknown but they too can be considered rare. Pricing should run $75-100.00 for intact gutter pairs either tete-beche or not. Gutter blocks are double that. Tete-beche pairs $15-25.00 and blocks at $35-50.00. These are less in comparison to the gutters because more were saved. Stamp pairs or singles with the LARGE corner selvage should run at $35-50.00 each! Just regular pairs should run at $15-20.00 each! I would consider their existing numbers in the same range as the tete-beche pairs if you were to break all the tete-beche blocks into pairs! 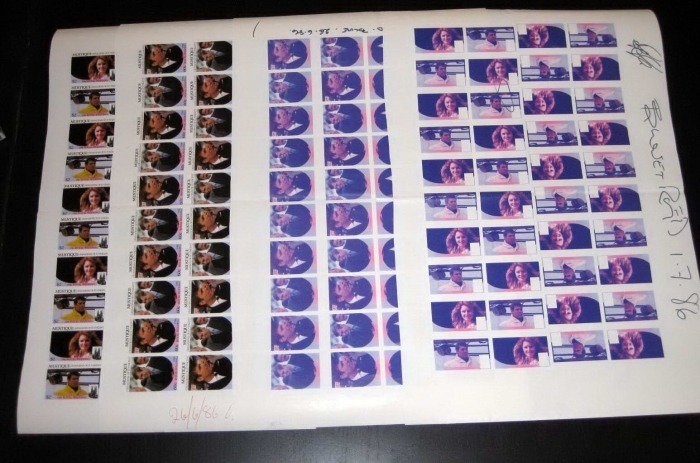 Intact uncut press sheets do not exist! There are no other perforated varieties for the Mustique issues! No specimen overprinted, no errors, nothing. 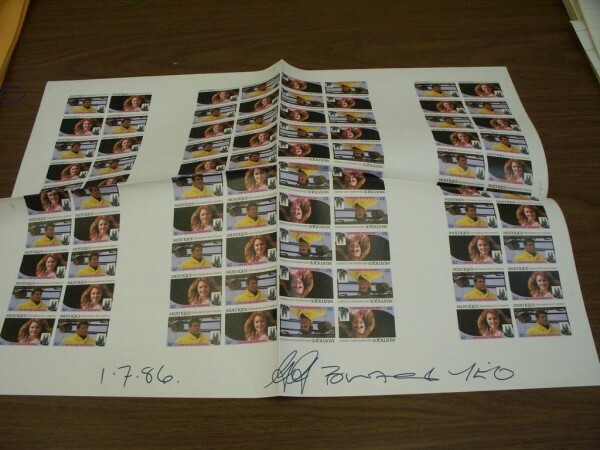 In my reuniting of this issue there was found to be two full sets of the imperforate progressive color proofs in intact uncut press sheets. Mr. Bileski documented it. 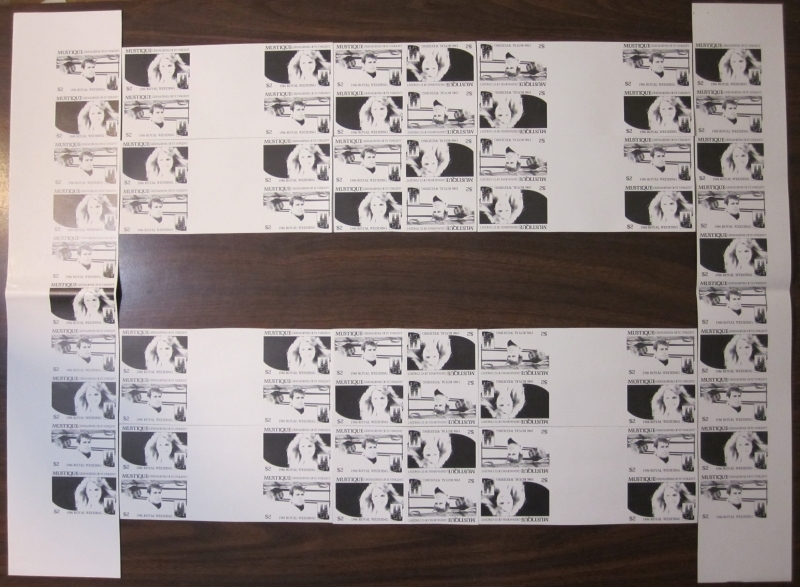 Apparently there was one more uncut press sheet of the $2 value with them. At this point I believe it to be the only intact press sheet of this issue left. In my search through the years for evidence of other varieties of the Mustique issue I found one other person who has pieces of both values from the progressive color proofs. They are pieces of the finals and the BLUE/RED stage. Here is an image of the center sections of the sheets. 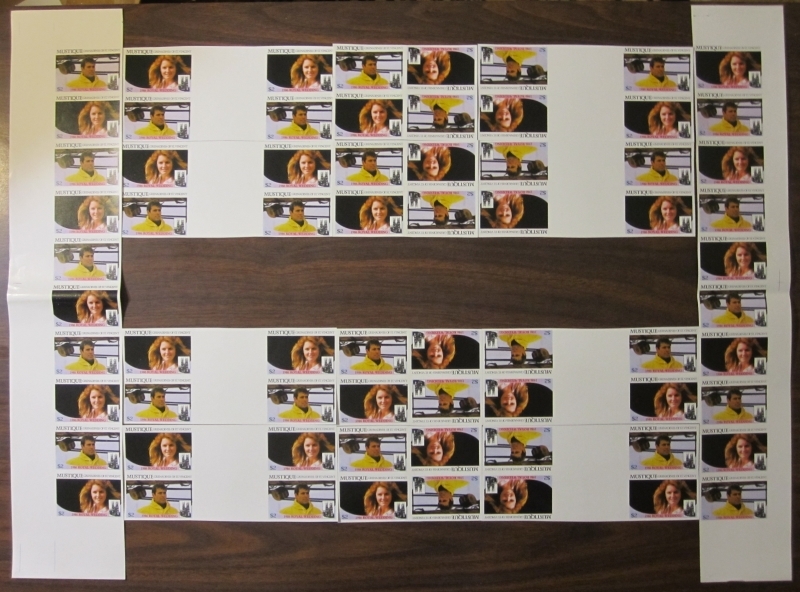 The other 40 stamps of the sheets have been cut into blocks of 4 and are being randomly sold. At this point it looks like these are the only other sheets that exist. 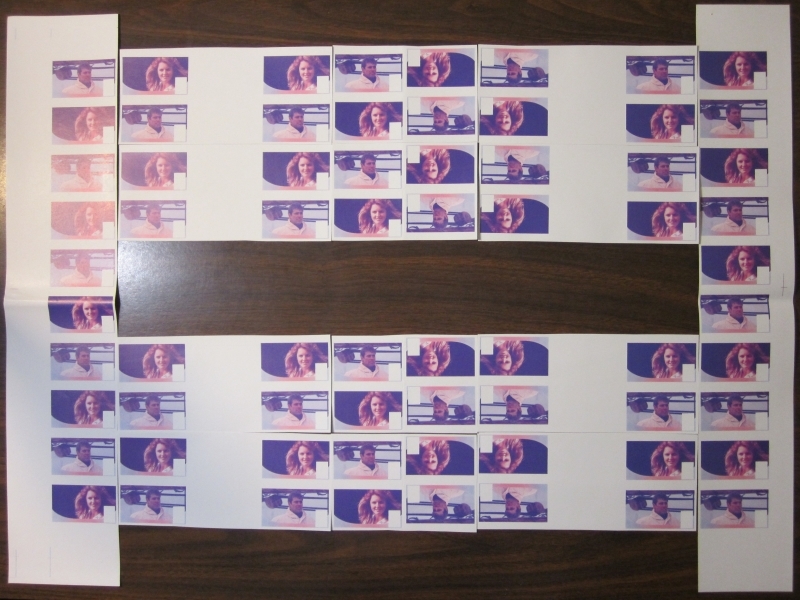 I stated above that Mr. Bileski received two full sets of sheets of both values of the progressive color proofs in his purchases of the archive. They were the only full sets found in the archive. 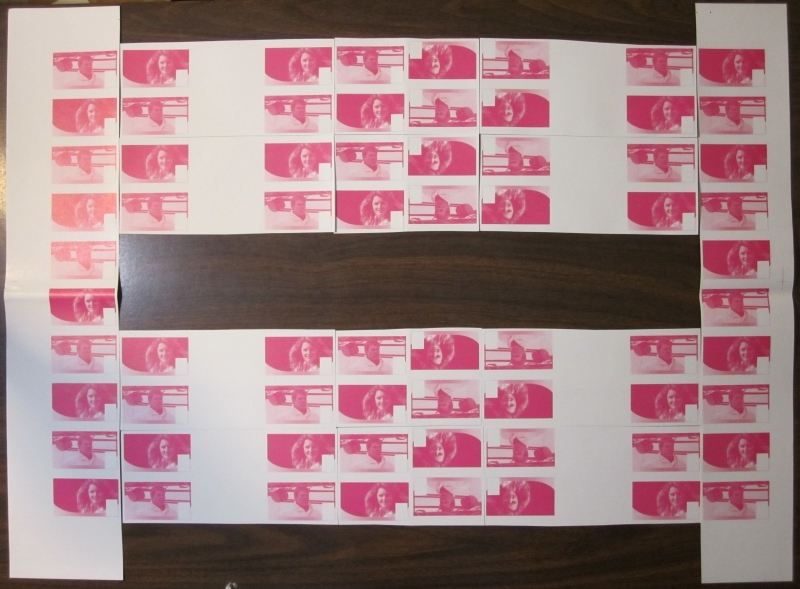 Mr. Bileski cut them up in the usual format stating he created 10 sets containing all the color stages with each color being in tete-beche gutter blocks, straight up gutter blocks and tete-beche blocks from the center of the sheet. Here from my recovery of them I must present a couple observations. 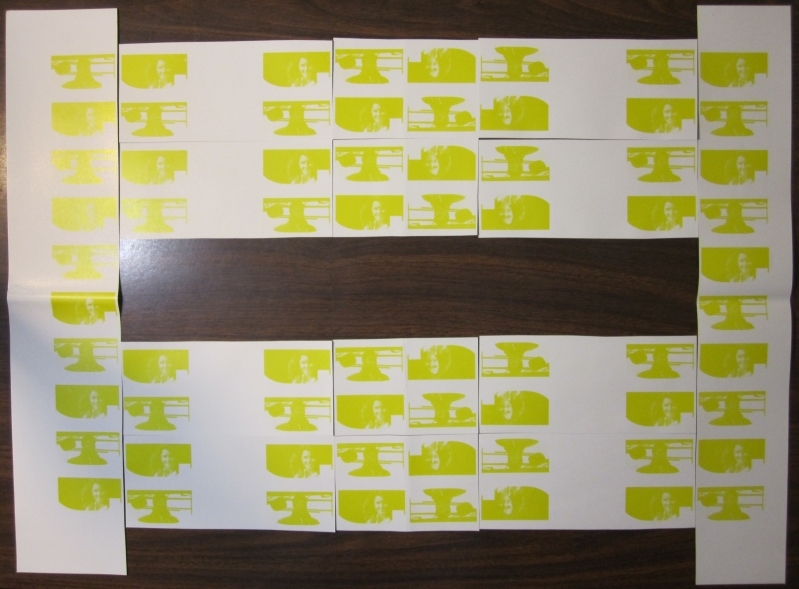 The sets I recovered all matched and were from the same set of progressive color proof sheets. The center set is missing. I believe it is possible that Mr. Bileski may have destroyed this set. The reason being that the sheets were all folded vertically and horizontally. The middle row of gutter blocks was folded between the stamps and gutters thus damaging them severely. The center tete-beche block was folded both vertically and horizontally thus also severely damaging the stamps. As a dealer I would consider this unsaleable material and I am sure that Mr. bileski thought the same. Getting back to the subject once the gutter blocks and tete-beche blocks were cut there is left a strip of 10 from each side of the sheet in all stages of the colors. These strips of 10 remained intact except he apparently cut off the corner pairs on one end of several of the strips. 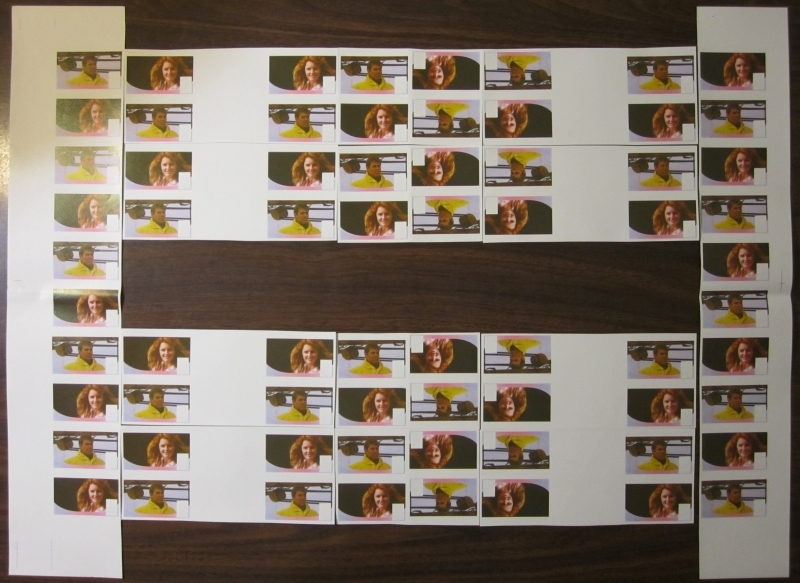 I was able to recover all the strips for the $2 value thus proving two sheets of each color existed. I also have recovered the corner pairs from two strip sets of the 60c value. The whereabouts of the 60c strips and what I consider possible other four gutter and tete-beche block sets is unknown. Possibly sold, possibly lost or possibly in some box somewhere. Time may tell. Given the maximum number of sets could only be 10 we can see these are extreme rarities. From my searches over the years no other sets have been offered. I would say confidently that it is very doubtful any will be offered in the near future by anyone but me. So far evidence shows there were four finals sheets and three BLUE/RED sheets and two of all the other colors. Mr. Bileski valued a set consisting of both values in seven color stages containing 14 tete-beche gutter blocks, 14 straight up gutter blocks and 14 tete-beche blocks at $2,000.00. A bit steep I would say but then he goes by the rarity factor. I would say pricing should be between $500-1,000.00 a set. At the time he guaranteed to buy them back if more complete sets of sheets were found. To this day this has not happened. 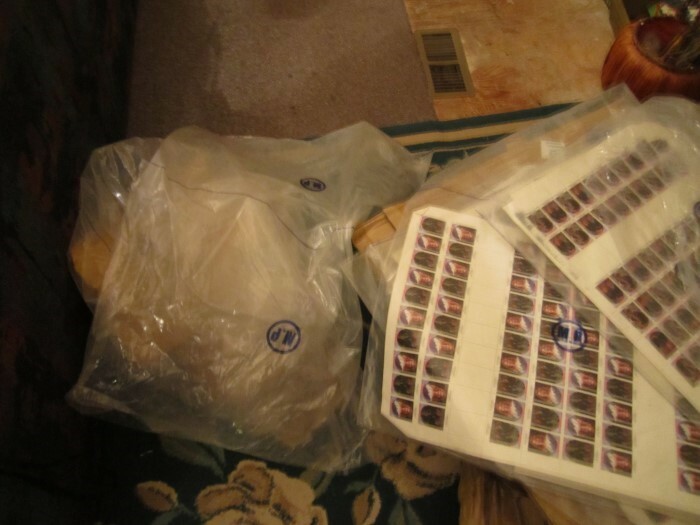 Nothing was found in the police evidence stock and even the perforated issues are no longer available from original sources namely the Stampdile network. Mr. Bileski passed on in 2006 and his estate was placed in numerous auctions at R. Maresh Auctions. Karl Marc of KMPhilately purchased one of the large lots which contained these sets. They were sold randomly and were purchased by me and several other buyers at the time. 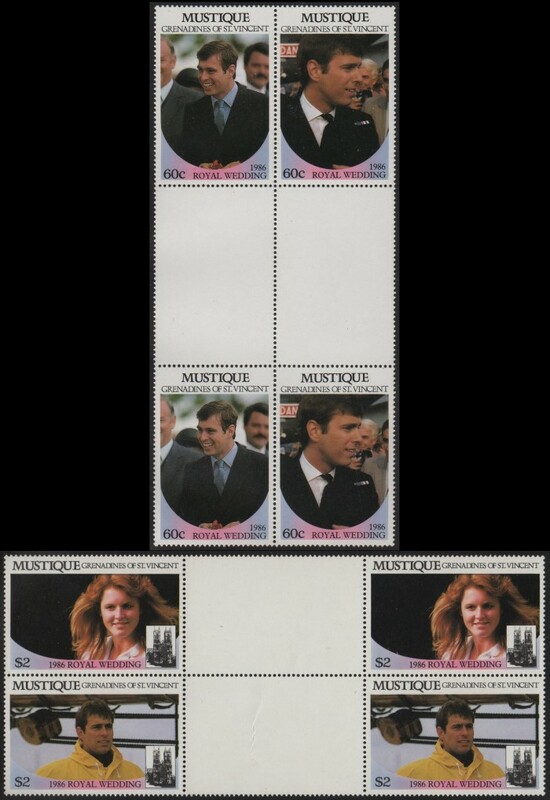 Over time I was able to purchase the other sets and pieces from the other buyers and so have reunited most of the pieces and thus I can now present to you images of the rebuilt uncut press sheets for the unissued Mustique 1986 Royal Wedding progressive color proofs! The probability of this not ever happening again is 99%! In other words the following picture images of each sheet rebuilt are probably going to be the only images of them ever to be made now and in the future. 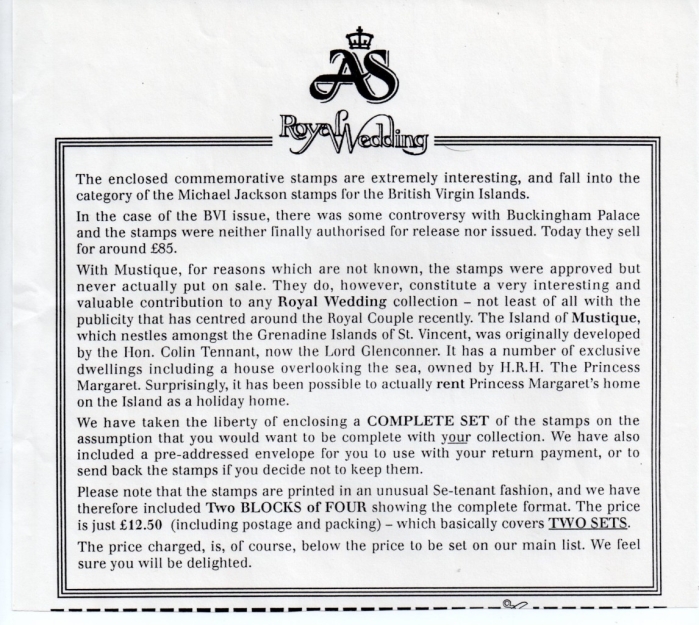 This basically sums up the stamp varieties for the Mustique 1986 Royal Wedding single stamp issues printed by the Format International Printers Ltd.
As new information and evidence is found it will be added to this page. Should you have new information or other pieces from the progressive color proof sheets please contact me.